We've been hearing about a next generation iPhone with dual rear camera for quite some time now. Naturally, later this year, Apple is expected to unveil two iPhones to succeed the iPhone 6s and iPhone 6s Plus, but the new camera setup seems to be exclusive to the larger model. KGI Securities analyst Ming-Chi Kuo (hailed by many as the most accurate Apple analyst out there) is, once again, talking about the new iPhones, possibly called iPhone 7 and iPhone 7 Plus, re-confirming that only the latter will come with a dual rear camera. Reportedly, compared to the 6s and 6s Plus, the iPhone 7 and iPhone 7 Plus have "similar form factors" - so they should sport displays measuring 4.7 inches and 5.5 inches, respectively. At the moment, we don't know if the pixel resolution has been increased (from the current 750 x 1334 pixels and 1080 x 1920 pixels ones). Will Apple's dual camera be better than the rest? we already have various smartphones that feature dual rear cameras - the latest being the LG G5 - Ming-Chi Kuo says that the dual sensor of the iPhone 7 Plus might, at first, leave us with an underwhelming impression. Of course, we don't really know what Apple's dual camera is capable of, so the final impression could be different. This wouldn't be the first time when the larger iPhone has an extra camera feature. 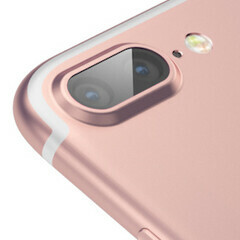 As you may know, the iPhone 6s Plus and iPhone 6 Plus offer OIS (Optical Image Stabilization), while the regular iPhone 6s and iPhone 6 models do not. This year, Apple already announced a new handset - the iPhone SE, but this is a low-cost model that looks like the iPhone 5s (though it packs upgraded internals). The iPhone 7 and iPhone 7 Plus will likely be unveiled in September, about one year after the iPhone 6s and iPhone 6s Plus. Are you planning to get any of the two next-gen iPhones? But they aren't following Apple, because 9 time out of 10, Apple didn't do it first. As your own post says, other OEM already have dual cameras. We already have knowledge that Samsung already has been toying with dual cameras: http://www.digitaltrends.com/mobile/apple-samsung-dual-camera-tech/ Again, you guys always think just because Apple may do something before Samsung, that Samsung is just following them. In most cases they are all working on the same tech at the same time. Some rush to be first while Apple and Samsung usually spend time perfecting it. But even if others do it first, Samsung only jumps in mostly when Apple does it. So they are copying Apple, in a lot of ways, who is copying someone else. But that is their mantra, do everything you're doing and everything the competition is doing. You can tell which is which based on what they execute well. The copied stuff is usually horribly implemented, their own inspiration is usually amazingly well done. He isn't saying Apple does it first, he is saying that Apple takes a technology and popularizes, so while someone may have implemented it first, Apple puts it into their device and everyone else follows suit after that. And Apple's functionality is usually better than the original. That is not what recent history has taught us. Where Apple have been fast to come out with something new they have soon been bettered by others, Siri followed by Google Now is a great example. When Apple copies like it did with maps it is a disaster, or allowing third-party keyboards. Apple Music and larger iPhones are yet more examples where they were late to the party but for sure did not arrive the best dressed! I only care about improved quality of photos. Anything else done with dual cameras is a gimmic including lg's wide angle shots which are just like panorama shots. I'm pretty sure the dual setup on next iPhones will be for gimmick reasons too. I still think this is Apple's way of boosting the Plus/Pro's sales. Serious question, name a single smartphone that has sold more than an iPhone? Follow up question, do you think everybody in the world reads articles on this website? Last question, do you think the most sold smartphone with a smaller advertising budget than Samsung relies on a single website and its articles to promote its phone? "...first impression may be underwhelming" Playing it safe eh, mister analyst? The iPhone 7 is coming out next year. This year will be the iPhone 6se. Apple should only release a 7 and iPhone Pro. There is no need for a 7, 7 Plus, and Pro model. If Apple does the Pro model they should go to at least 6" and not a rehash of the 6/6S size. Apple is behind the times and should have at least QHD along with AMOLED this year. To wait another year for this tech will most likely lose some customers since the technology has been available for years through Android. how can it be a problem if it's already been available for years on Android? The bottom line is that the average customer don't care about a higher resolution. This is where the bulk of sales come from. A higher resolution iPhone would not generate anymore sales than what it has now. You speak as if iPhone sales have been in decline for a while. Actually that's Samsung. Apple has yet to officially announce a sales decline, but they may soon. That's purely based on the market saturation and the fact that smartphones have plateaued in general. The days of crazy growth are over! Iphone sales been in decline since the 6 in fact. Problem is sales number are not sale to user number but sale to carrier number. Just to give an example we returned nearly 200000 iphone 5S 16 gb to Apple for refund as they wont sale because of the new SE and we do this every year. So lets say Telus sales 1000000 iphone a year ( we only have like 8 millions customers we are not big like AT&T ect ) we still return 10% to 20% of the iphone we order ( depending on model and size of memory ) and i beleive others carrier are similar. So you can take the number they gave ya and remove 10% at least for total sales every year and its getting worst year after year like iphone 5S 16 gb we returned nearly 20% of 2015 total order we made to Apple.. The end result is sales are slowing down since a few year now..
Now we know where the Se cases are coming from. Bring the new unused phones in, open them up, shove in the new PCB, can basically use the same box too and just reseal them. Cost to Apple? Less than $100 of time and effort, equals profits. Stop with these stupid comments, dude. It will cost any company much more to re-assembling old hardware. You're confusing sales for growth. Sales have increased year-over-year, but growth is slowing. Apple has matured and since there is so much competition from rising Android competitors, potential customers are being snatched up by low-cost high-end devices. But, how long can these companies continue on that path since they make little to no profit off of their devices. Apple is becoming too big. It's unrealistic to think that they'll just keep beating their sales records year after year. But they're still making a lot more money than anyone else. These dual cameras and USB HD audio would be half enough to lure me back to Apple. The other half: A 6-inch-plus iPhone that lets me use Nova Launcher. I'm switching to Android this year!....But I have been saying that for 5 years!